Rediscover your skin's youthful capacity with BAKEL Elastin Elasticising Face Serum, an anti-ageing serum that performs firming action on the complexion. Combining potent Hydrolized Rice and Lupine Proteins, the formula expertly maintains and enhances elastin fibres to help restructure and firm the skin; its hydrating and smoothing properties help prevent and reduce signs of ageing for younger, more toned looking skin. 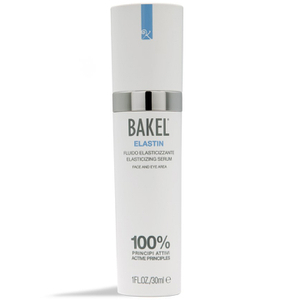 Suitable for sensitive skin, the antioxidant-rich serum will endow skin with improved firmness and elasticity. Apply daily, in the morning and in the evening. Gently massage onto face, eye-area, eyelids, lips, neck and décolleté, until complete absorption. Proceed with your usual moisturiser.